A group exhibition presenting a selection of artworks created with the intent to reconstruct historical deeds or contemporary events. Autopsia de lo invisible (Autopsy of the Invisible) proposed that artistic research materialized in various forms, whereby an artwork’s very materials carried part of its content and meaning, and whereby its accompanying object label stood for a type of diagnosis, of both the artwork and its subject matter. The exhibition emphasized the staging of something for the purpose of analysis more so than entertainment or contemplation. And the exhibition display performed this quite openly, incorporating as its main element a curtain that covered the entire gallery space. To see the exhibition involved slipping in the space behind the curtain. The exhibition design in general took as its cue an element of theatre and mixed it with an aseptic feature of a laboratory, reminiscent of the modernist white cube gallery space, then spun it around with a dream scene in Hitchcock’s film Spellbound. 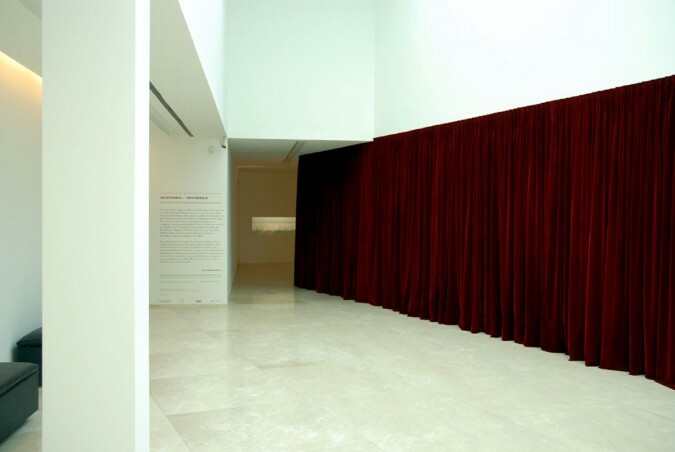 A red curtain stood then as the gallery’s soft façade, with white lining facing the interior of the gallery space. The curtain was meant to suggest a staging, a showing, and to remit to a behind the scenes, a focus on the structures and processes proposed by the artworks in the exhibition.